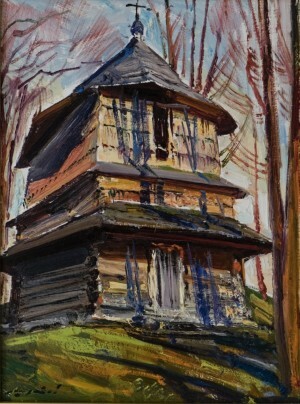 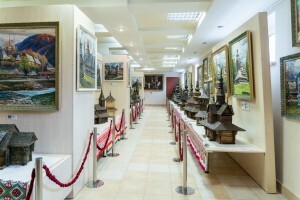 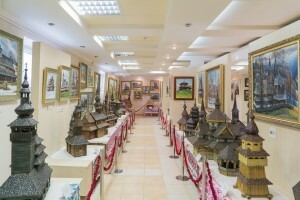 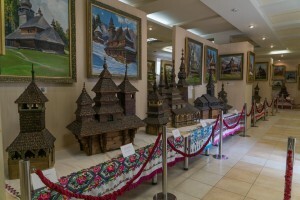 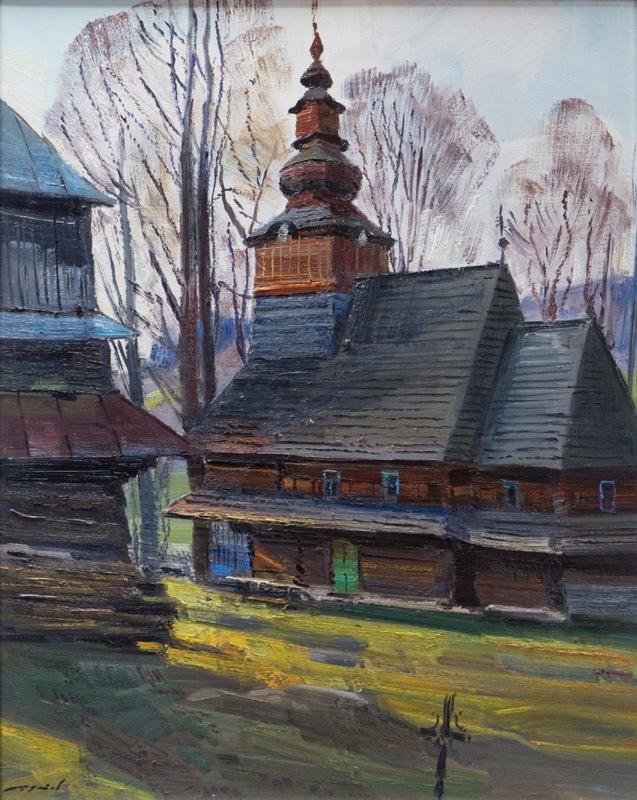 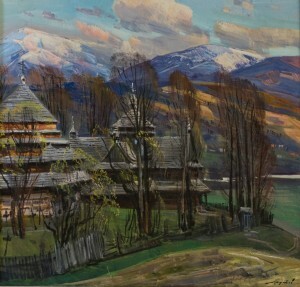 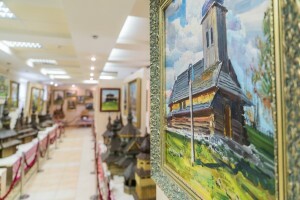 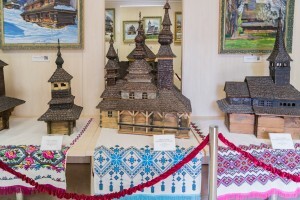 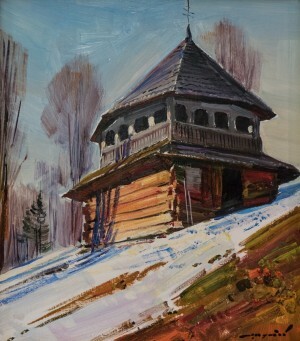 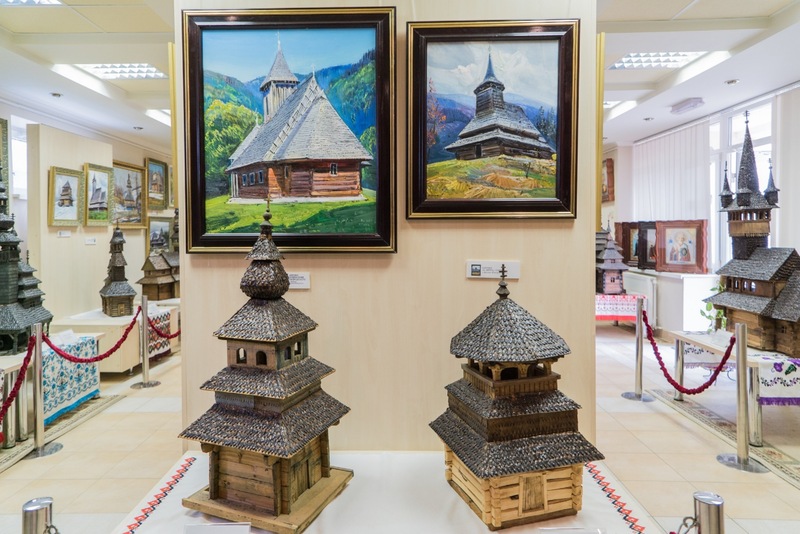 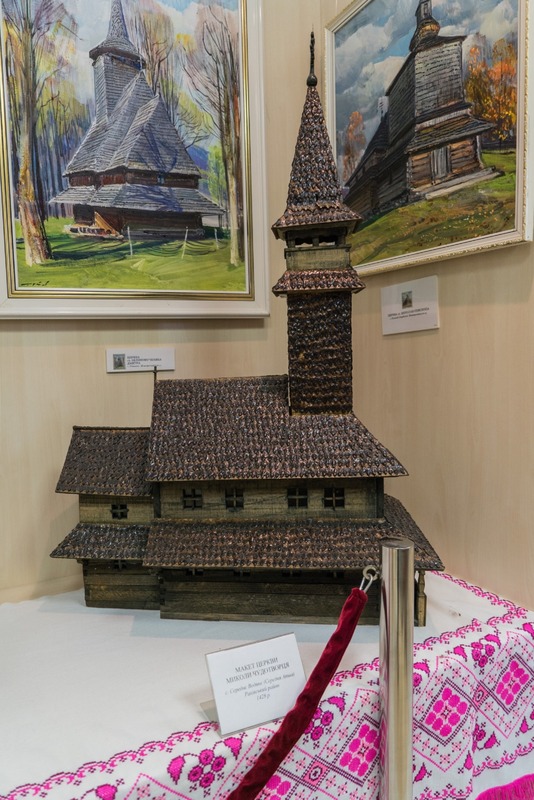 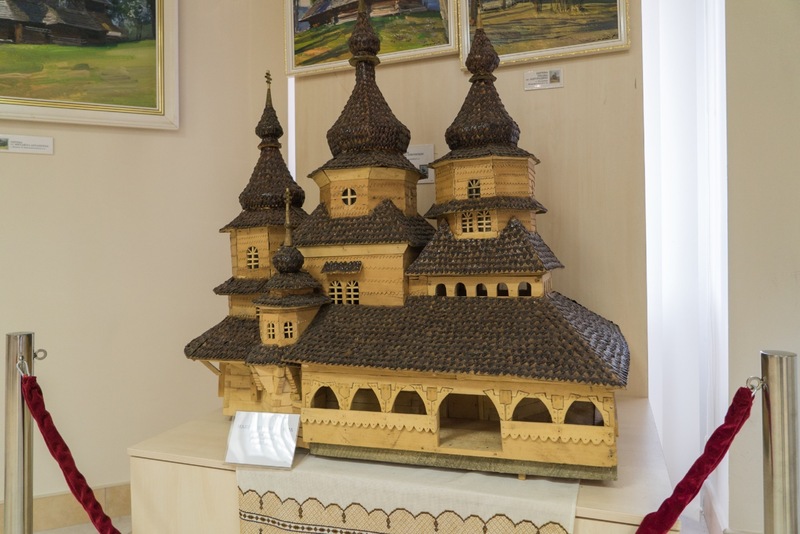 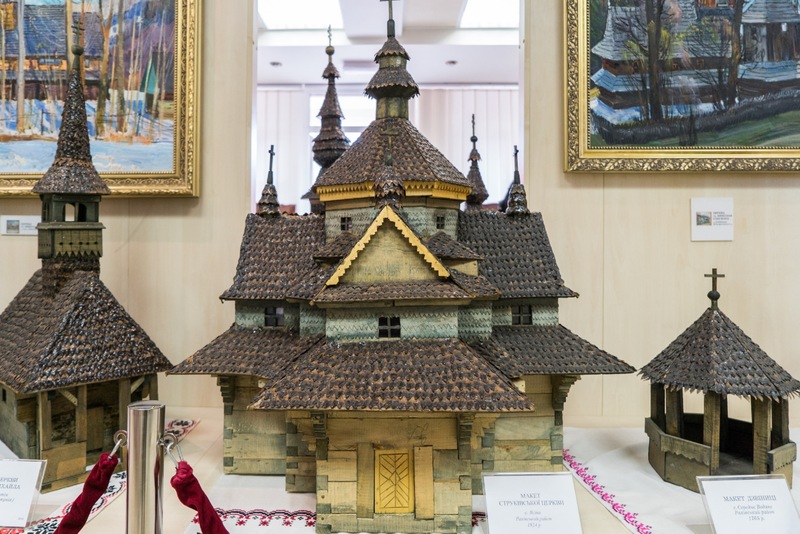 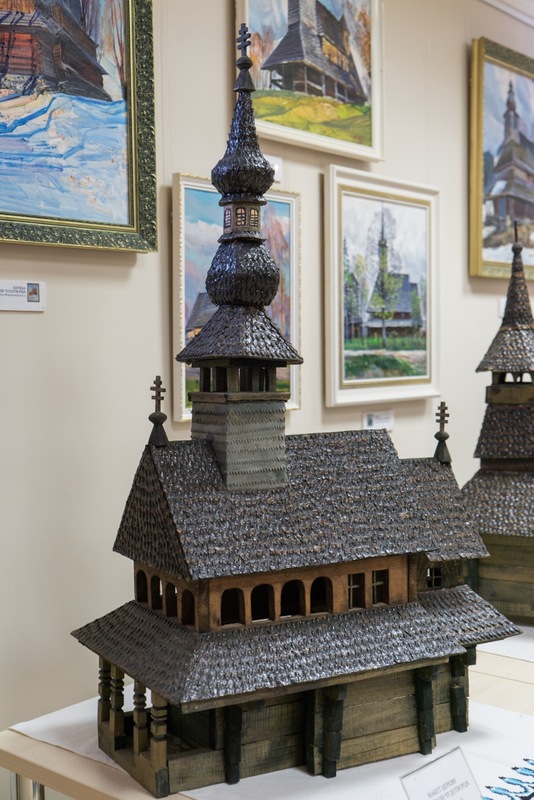 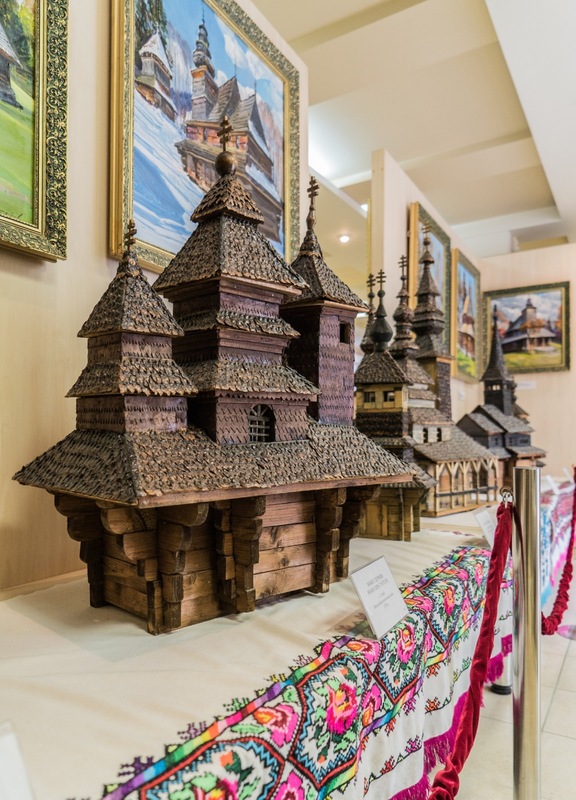 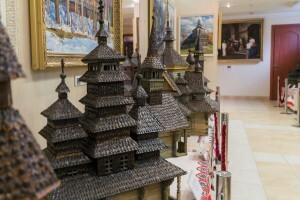 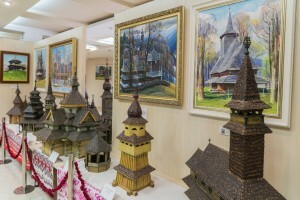 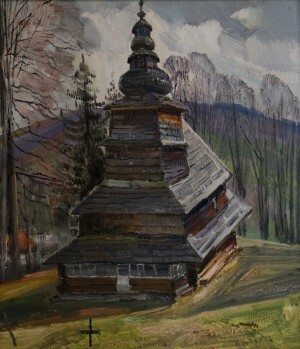 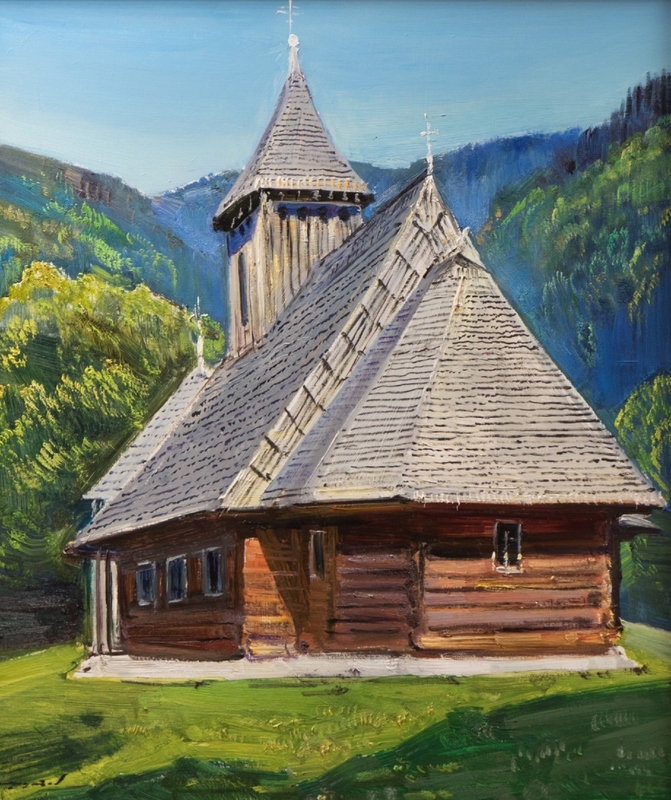 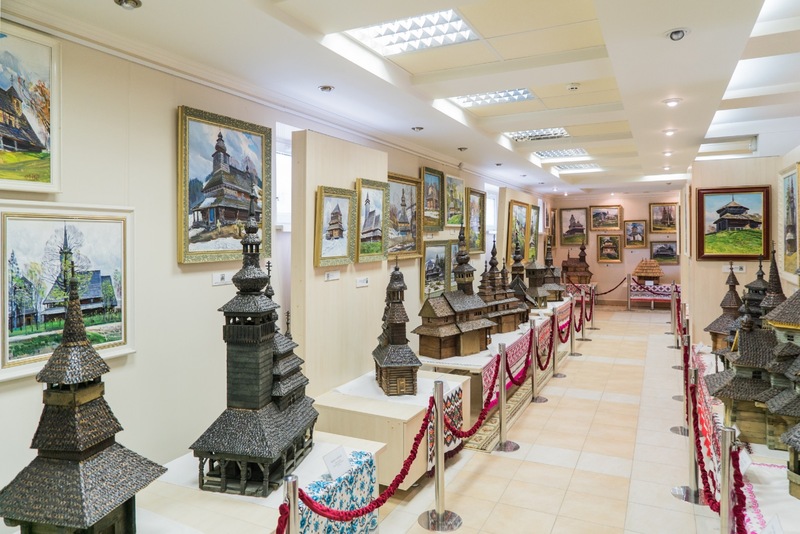 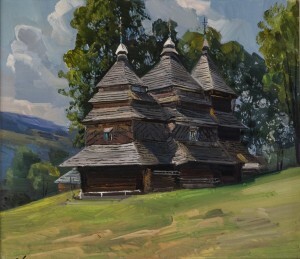 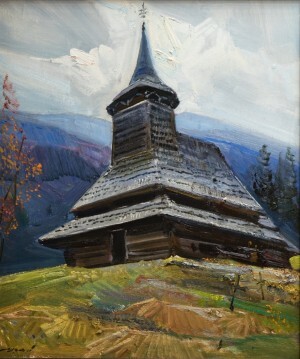 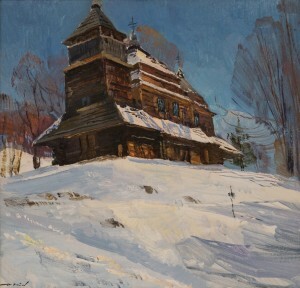 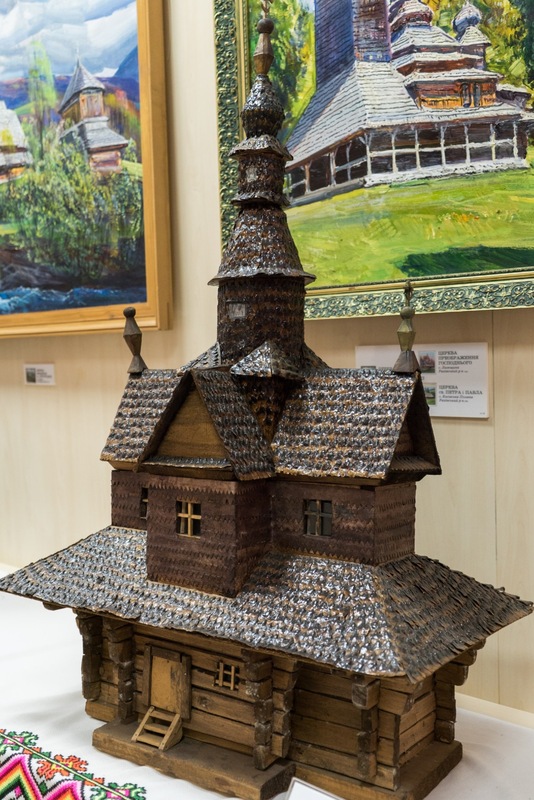 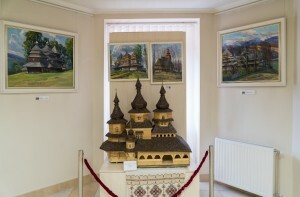 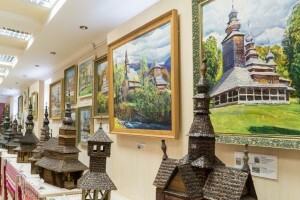 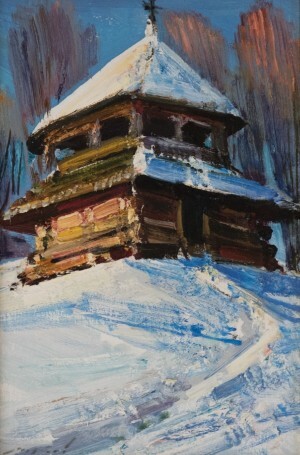 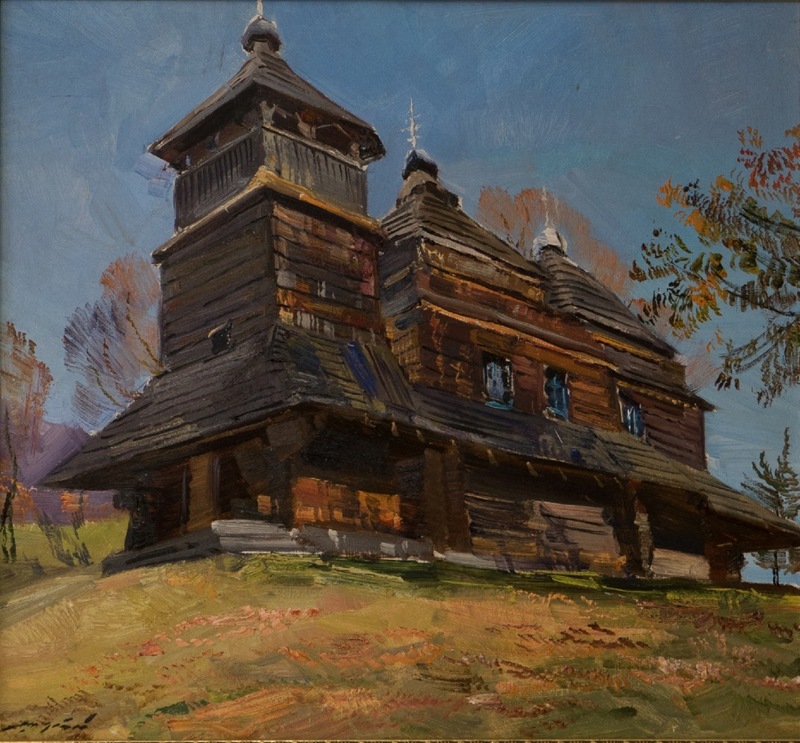 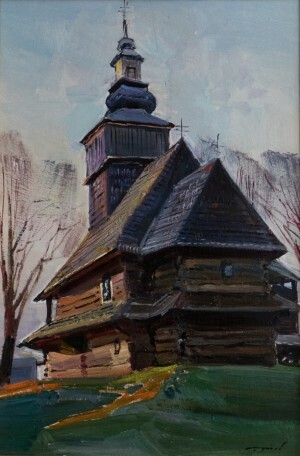 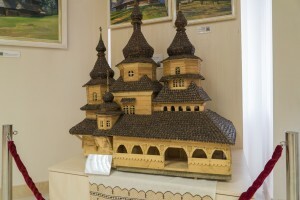 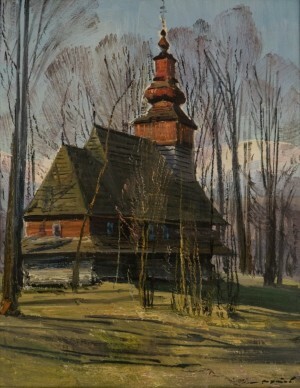 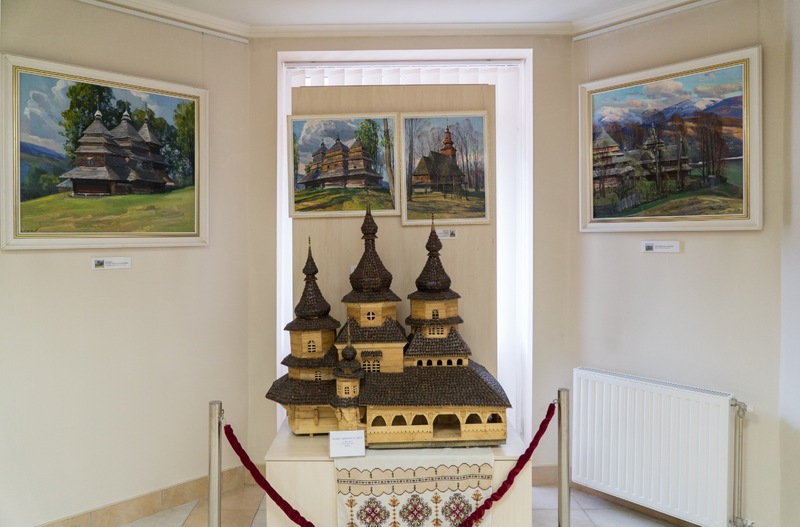 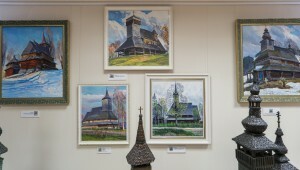 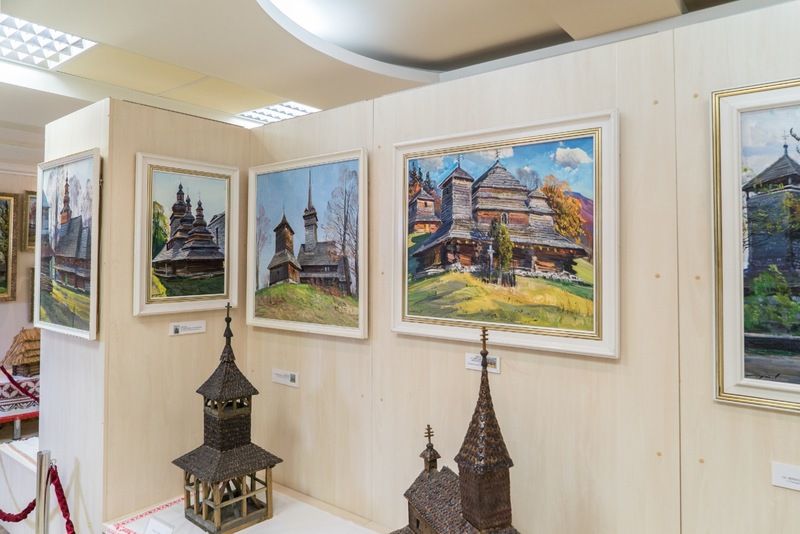 The exhibition “Church and Wooden Architecture of Transcarpathia” was opened in 2005. 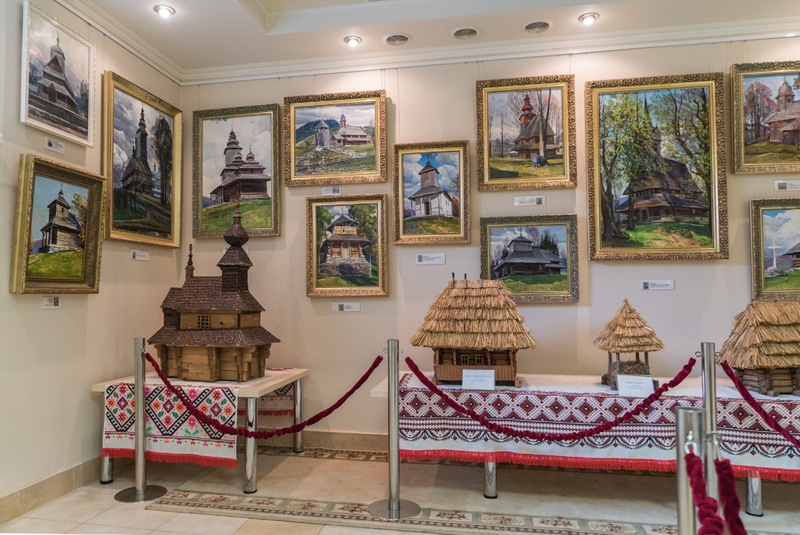 The initiator of the exhibition is the founder of the Charitable Foundation "Spiritual Revival of Transcarpathia" Mykhailo Riabets. 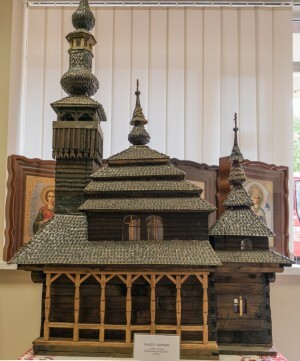 The Foundation is engaged in preserving the spiritual heritage and the restoration of the wooden churches of the region. 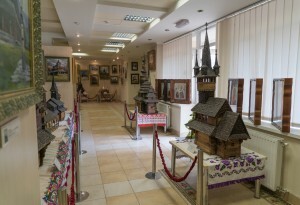 At first the exposition was located in one of the buildings in Berehivska Street, but later it was moved to a small room in the courtyard in 4 Pirohova Street – it is closer to the city centre, there is larger flow of people. 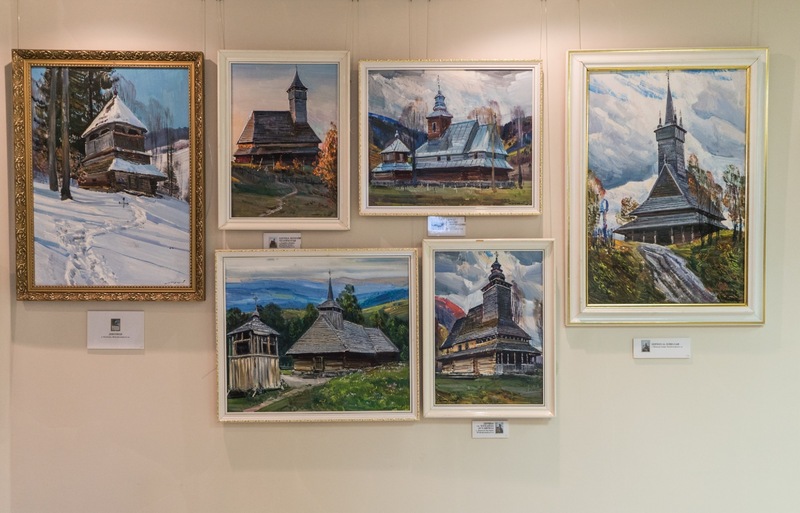 Now exhibition funds include 109 paintings of the People's Artist of Ukraine Ivan Shutiev from the series "Prayer In the Tree", on which the master worked more than 50 years. 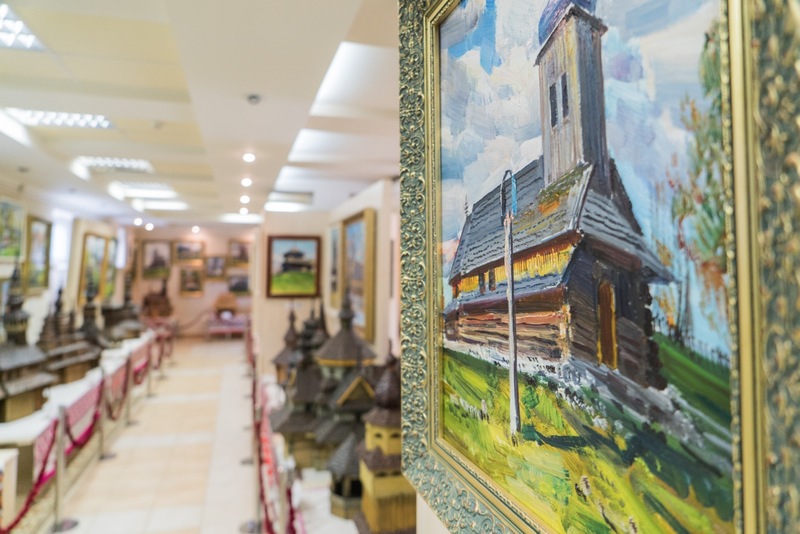 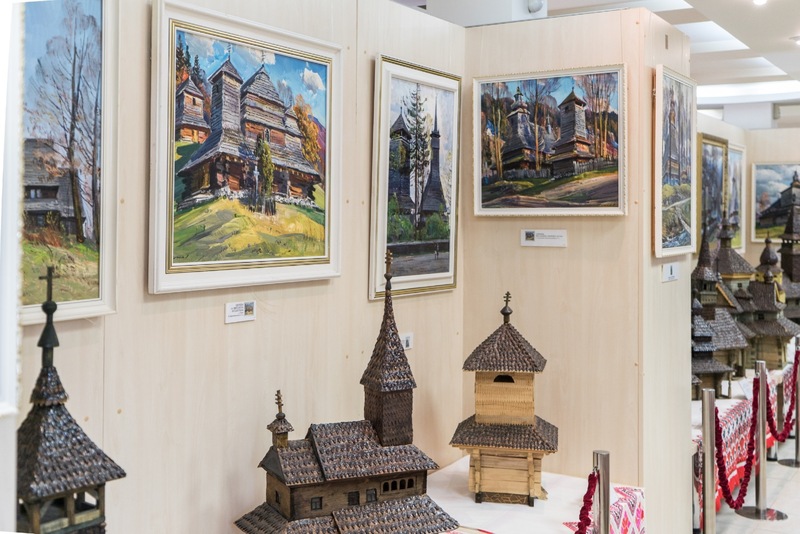 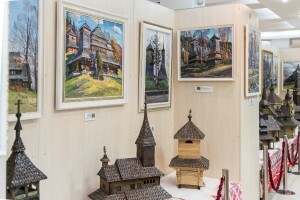 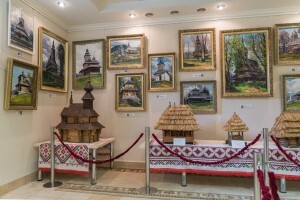 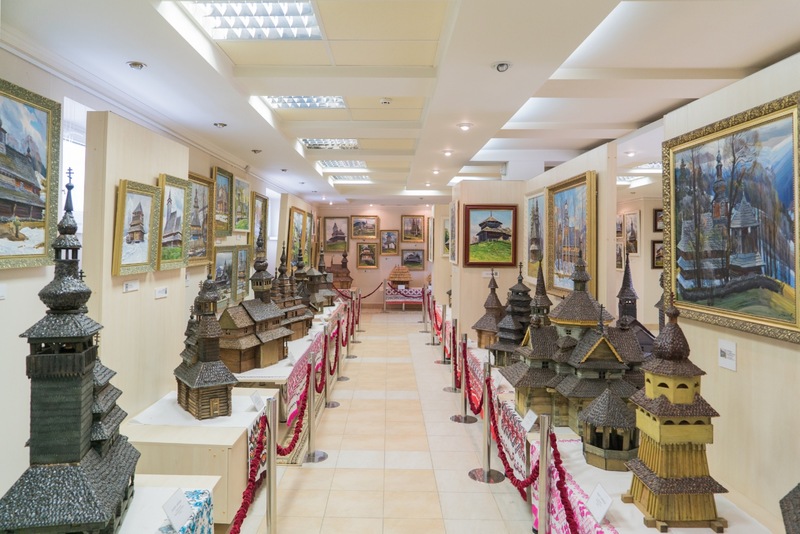 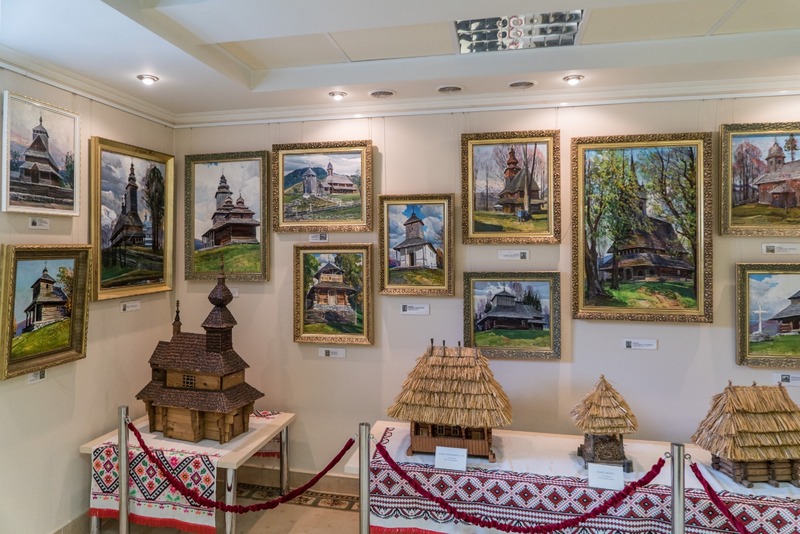 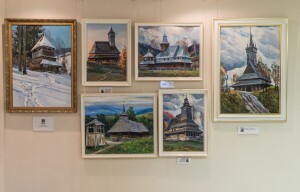 Over time, the collection of paintings was enlarged by 43 layout sheets of the folk artist from Mizhhiria region Andrii Vorobets, who spent for this work the last 20 years of his life. 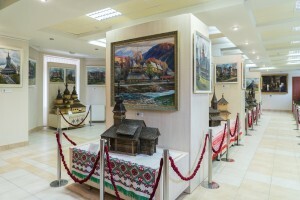 The paintings are made with oil paints on canvas. Layout sheets are carved from wood with ordinary knife and assembled without a single nail. 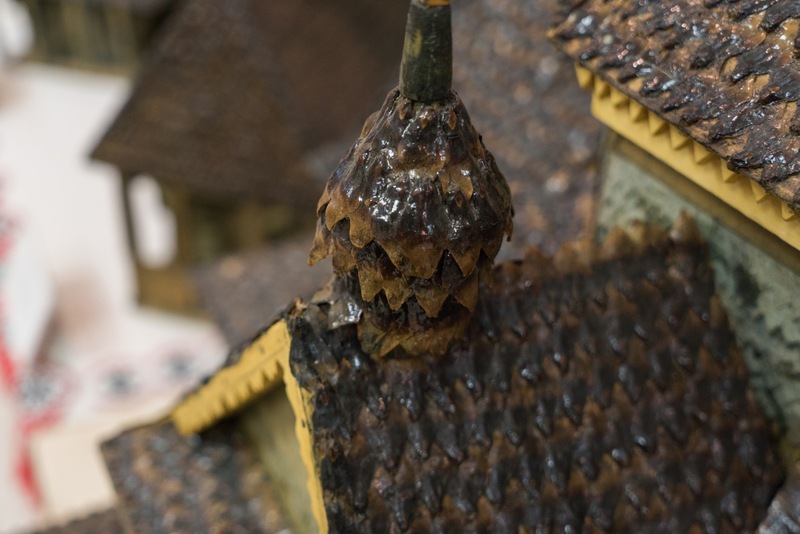 Roofs are made of scales of cones and resemble shingles – plaques with notches that served as a roof of churches. In the museum it is noted: layout sheets are not a perfect copy, but a free interpretation, the author's vision of the master. 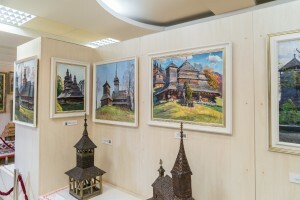 In the paintings and layout sheets now one can see churches and temples that do not exist anymore – a lot of them were burnt or were burned intentionally. 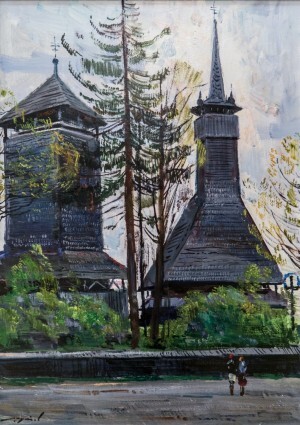 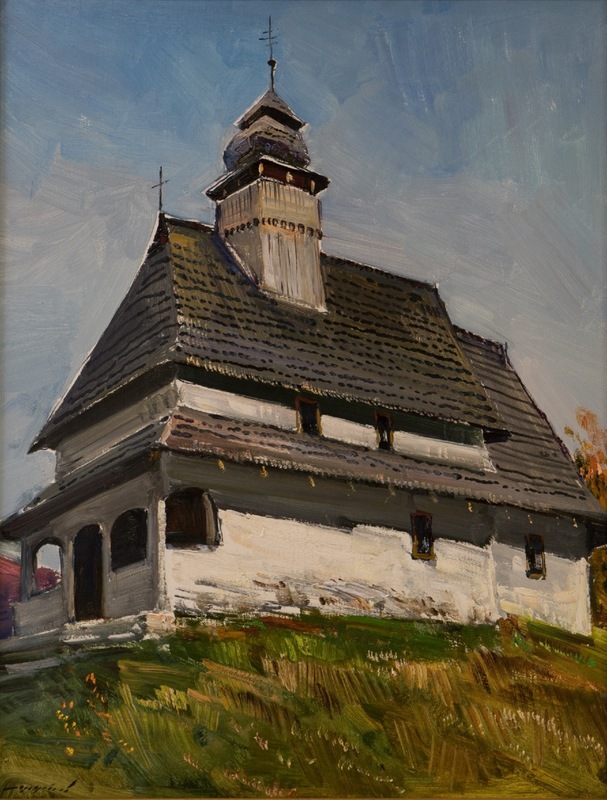 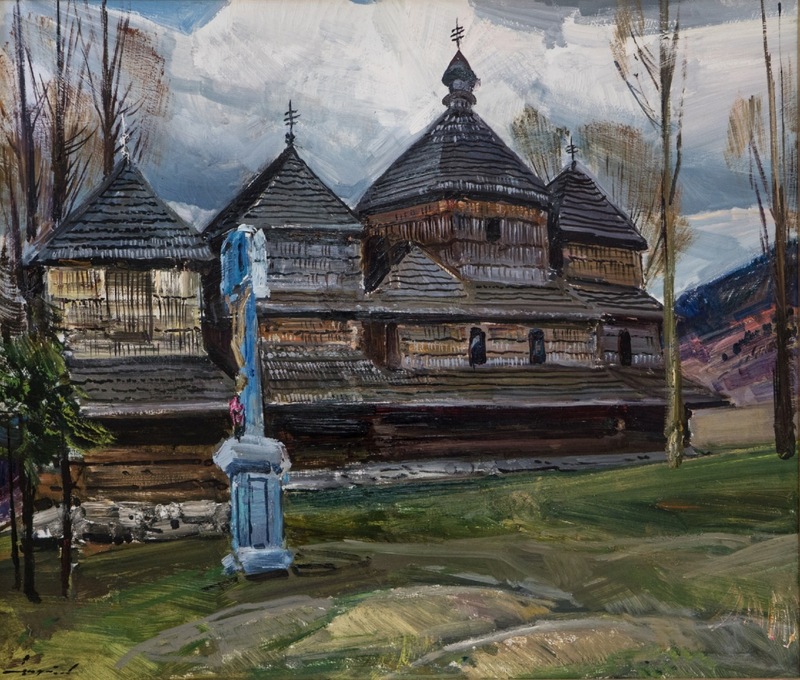 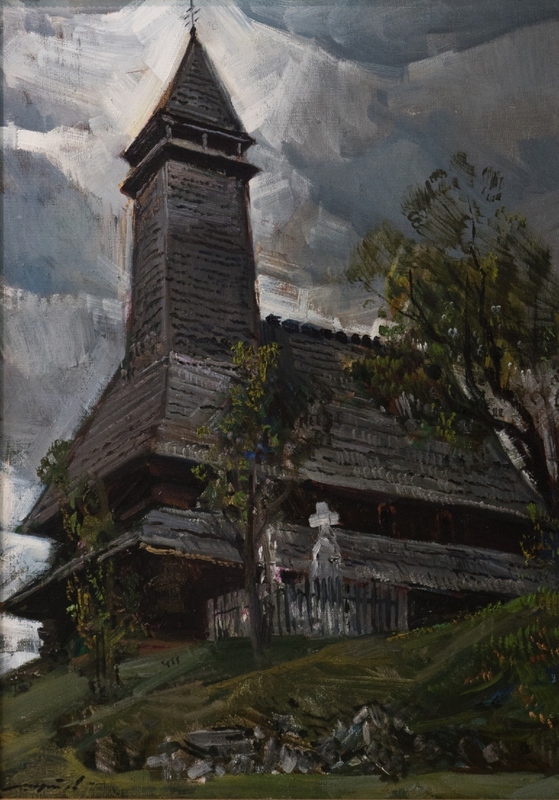 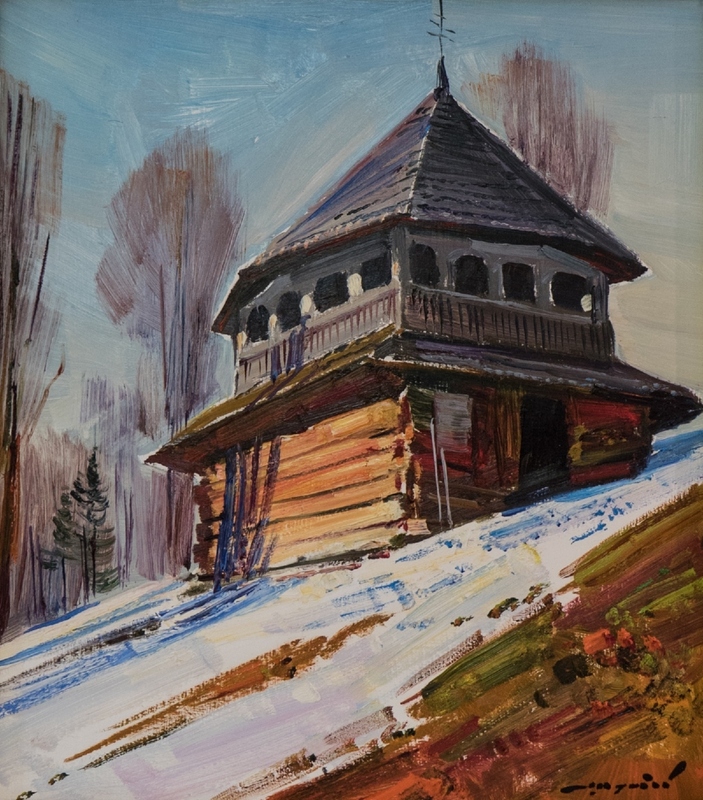 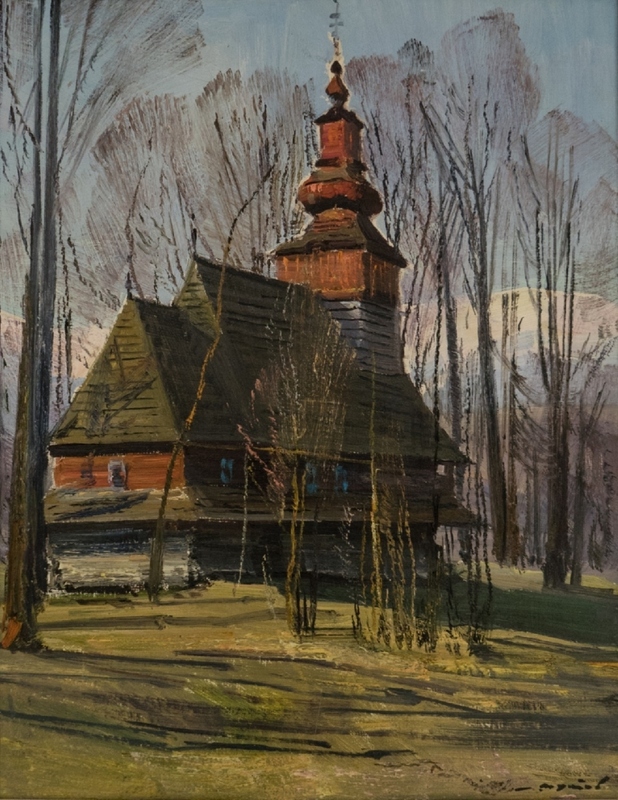 They tell in the museum: before there were more than 600 wooden churches in Transcarpathia, now - only 106 left, many of them are in a state of disrepair, in some of them the church service is held only on major church holidays. 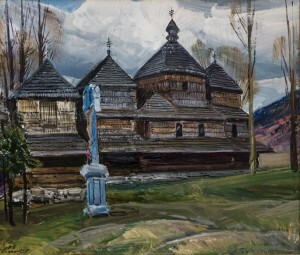 However, here you can see the images of the Church of the Presentation of the Blessed Virgin Mary (XVIII century, Pavlovets village of Mizhhiria region), St. Peter and Paul (1794, Vuchkove village of Mizhhiria region), the Purification of the Blessed Virgin Mary (1888, Nova Roztoka village of Volovets region), The Holy Spirit (beg. XVIII century, Huklyvyi village of Volovets region) and others. 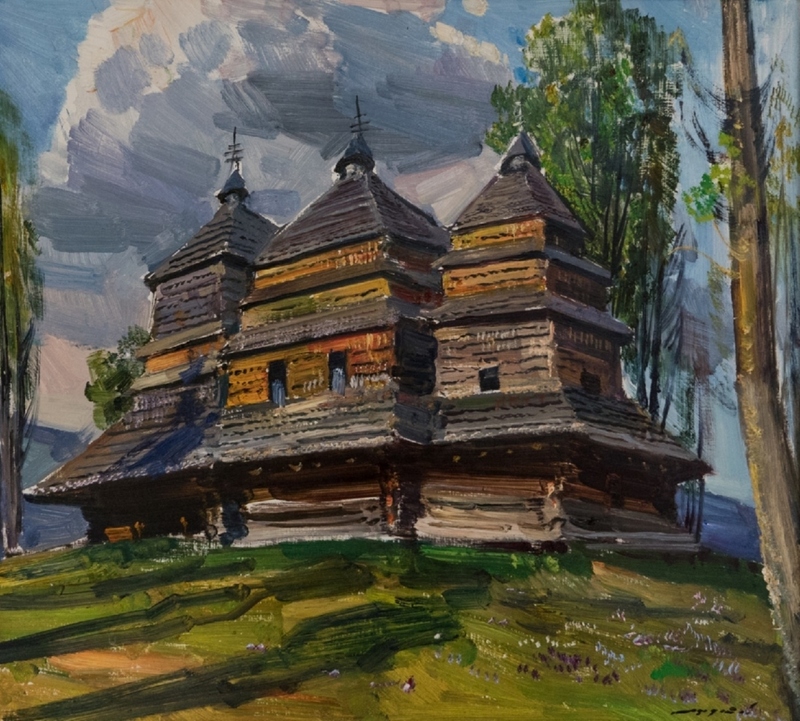 Among the layout sheets there are the Church of John the Baptist (1679, Sukhyi village of Velykyi Bereznyi region), the Great Martyr Demetrius (1780, Repynne village of Mizhhiria region), Saint Nicholas Bishop (Izki village of Mizhhiria region) etc. 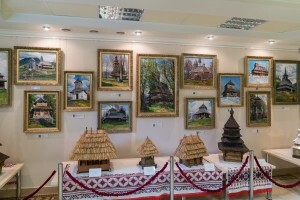 There is also the layout sheet of the house of the people’s artist, the author of all these works. 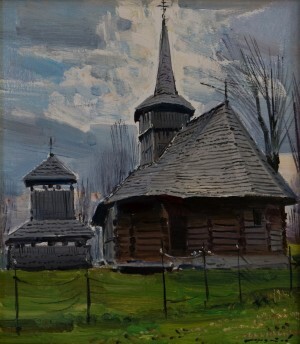 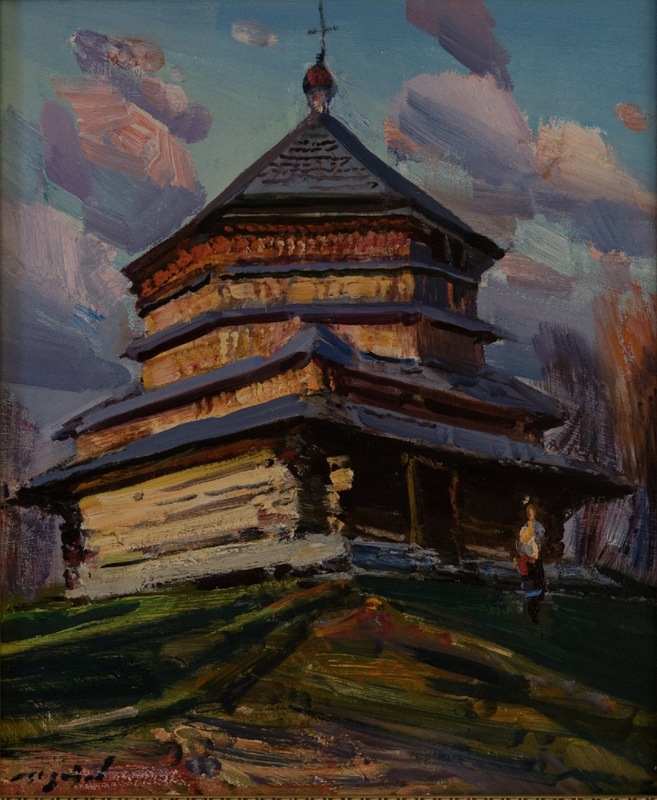 It is represented one of the oldest wooden sacral buildings of the region – the Church of St. Nicholas the Wonderworker, built in 1428 in Serednie Vodiane village in Rakhiv region. 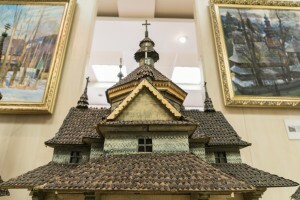 Now in Ukraine it is left only two churches of the Lemkiv style – one was built in 1777 in Shelestovo village Mukachevo region and now it is transported to the Transcarpathian Museum of Folk Architecture and Life in Uzhhorod, and the other one from Khust region was taken to the Kyiv open-air museum "Pyrohovo" – layout sheets of both churches can be seen at the exhibition "Church and Wooden Architecture of Transcarpathia". In addition to the mentioned works, one can see here a copy of the painting by the artist Mihály Munkácsy, "Christ Before Pilate", which was made by Ivan Shutiev. Entrance to the exhibition is free, but anyone can leave a certain amount in the donation box –thanks to the collected funds the church in Khust was restored.